I am having sleepless nights because I am excited. 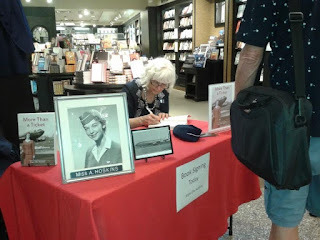 My book: More Than a Ticket Memoirs Flying with American Airlines from Props to Jets is out there making new friends. As you buy the book and read it, know that I look forward to hearing from you at argie.ella@gmail.com Thanks to new and old friends for your comments and telling me what you like about the book. It helps me understand what the reader is enjoying, and as I continue to write my new book: Please Don't Call Me! Dumb, I consider what not only the brain, but the heart, is saying to my words. The following are a few of the comments which have come my way. I bought your book in the SLC airport bookstore; my husband and I are private pilots from Connecticut, if you remember. I read about 75% of your book on the flight to BWI and finished it 2 days after we got home. I REALLY enjoyed reading about the period of commercial flying during which you were a stewardess when flying was something special unlike the “cattle car” experience of today. The first time I flew on a plane was in December of 1977 when I flew to SLC with my then husband-to-be (whom you met) so we could get married at his brother’s house in Reno. It was SO exciting and the stewardesses were so nice. The only thing I did NOT like was the smoking on-board, so there is one improvement today! Thanks again for writing such a fun and interesting book! A wonderful book about an American Airlines stewardess who served on the nation's first domestic jet flight, rose lemonade, and a beautiful Tuscany candle in "Fresh Linen"! Please, everyone, get this book. It's wonderfully written by my friend, Argie! She signed it as well. Argie, your book arrived yesterday and I haven't put it down since! What an amazing story beautifully written! I love all the notes and correspondence. I actually felt your heartache when you put your head on your supervisor's desk in the office requesting to leave!! WoW! Thank you so much for signing it. I will treasure that always. Take good care my friend and thank you for sharing your story. Fantastic book, Argie; thanks for undertaking the project; it's a keeper! I've got the book and am enjoying it - great book Argie! Literary genius you are !!!!! I love to use materials like your book in the classes that I teach on the history of travel and the history of air travel. They are an invaluable source to provide personal information to give students a sense of what it was like to work for the airlines and to travel by air. Argie I have been reading your blog and caused my secretary to stay about 30 minutes late because she is a big American Airlines fan and wanted to see what I was reading/viewing. Congratulations on the new book and all the great nostalgic pictures. Argie, your book is amazing! I am fascinated by the amount of information and photos you have accumulated and that you were able to compile them in such an interesting way. I have got to sit down and start reading it from the beginning but when I pick it up, I'll open to a page that I can't put down. I can't thank you enough for gifting me with it...but can I at least pay for the postage? I will be sharing it with our luncheon group this Friday. The signing on July 3, 2015 was so much fun at the Salt Lake International airport. And I am invited back for another signing on the 27th of July. 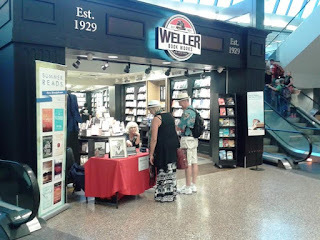 Terminal 1 at the Salt Lake airport on July 27th from 9:00 until 12:00 AM at the Weller Book Works. After you pass Security and before you take the escalator, I will be sitting there to greet you. Of course, you will need a ticket to get through Security! So have a good flight with a peaceful landing. Discover how to book free flights using TRAVEL HACKING.